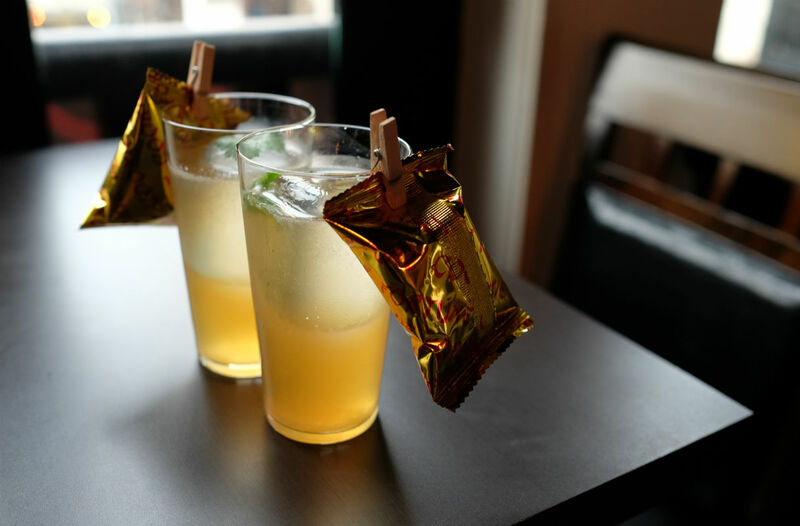 The Chinese New Year cocktails at Nutmeg & Clove will boggle your mind. We love Nutmeg & Clove. We don’t say that often enough – and we certainly aren’t so effusive about every bar we visit – but the avant-garde Singapore cocktail bar has that certain irreverence rather irresistible to adventurous cocktail hounds such as us. Its regular cocktail menu is already hardly innocuous – which it recently revamped as inspired by Southeast Asia’s natural history, and even features notoriously stinky durian – but when it comes to Chinese New Year, Nutmeg & Clove goes all batshit cray cray. Consider last Chinese New Year when its disregard for cultural propriety meant concocting tipples that tasted like festive goodies such as bakwa and pineapple tarts; this year Nutmeg & Clove follows the same vein by using ingredients associated with Chinese New Year dishes to create three drinks for this Year of the Dog. Take for example, the Reunion ($18++, above), a variation of a sweet martini that uses ingredients more commonly found in a Chinese herbal soup than any alcoholic drink – Hendrick’s Gin infused with red dates, Chinese mushrooms, wolfberries and angelica root, for a herbal tea-like concoction that’s familiar and yet atypical all at once. Similarly unorthodox is “旺” ($18++, above), which sees ingredients such as dried oysters, mushrooms and dried seaweed that should be in a Chinese New Year pen cai (盆菜) – a tun of mixed vegetables, meat and seafood – instead. It’s a savoury, umami-laden twist on the classic Dark & Stormy, but its flavour might need some getting used to. 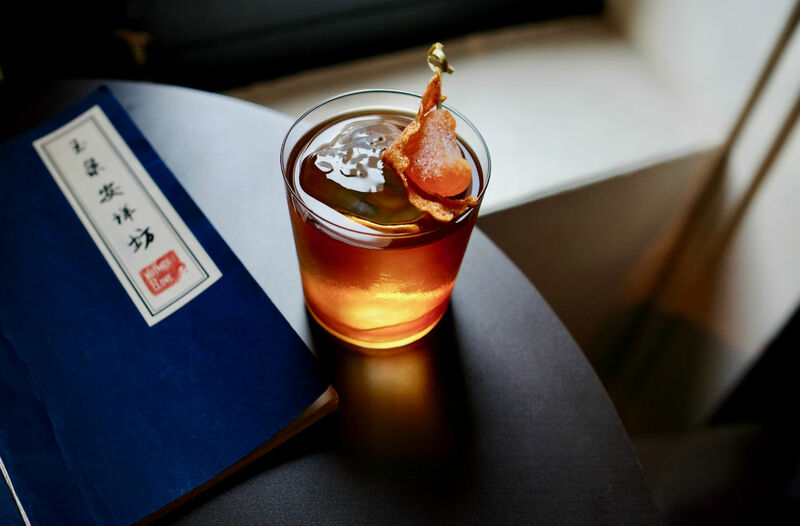 Just as interesting is its garnish, which sees a dried fish cracker paired with candied orange that actually tastes good together with the drink. But our favourite has got to be Fifteen ($18++, main picture), named for chap goh meh, or the fifteen day of Chinese New Year. It’s the day when families again gather to feast, and when tang yuan – glutinous rice balls stuffed with ground peanuts or sesame seeds, and served in a sweet broth – are eaten. This cocktail reinvents this with a bourbon that’s been fat-washed with roasted peanuts, along with osmanthus, lemon juice and then topped with a roasted black sesame foam. It’s also one of the best whisky sours we’ve ever had, and should be a thing. So if you’re looking to celebrate Chinese New Year in a more unorthodox manner, Nutmeg & Clove’s seasonal Chinese New Year cocktails may well be a good way to do so. We’d advise you to drop by during happy hour – from 6pm to closing on Monday and Tuesday and from 6-8pm Wednesday to Saturday – when these cocktails go for just $14++.